The central parity rate of the Chinese yuan (RMB) has appreciated around 10 percent against the U.S. dollar, from 6.95 to 6.34, since the start of 2017. In turn, it seems the expectations of a weaker renminbi against the dollar have been replaced overnight by expectations of a revaluation. So, what is the reason behind the sudden appreciation of the RMB exchange rate? And where will the future RMB exchange rate go? One reason for the strength of the yuan against the dollar, obviously, is the greenback's weakness. The dollar index, a gauge that measures the U.S. currency's strength against six other major currencies, has declined more than 5 percent since last December. The index will more likely continue the losing streak as macroeconomic and policy factors are expected to restrain the strength of the U.S. dollar, ICBC International economist Cheng Shi said in a report. Another reason for the yuan's appreciation, more importantly, comes from the sequential reforms of the central parity price mechanism of RMB. After the so-called "8/11 currency reform" launched on August 11, 2015, China adopted the "the managed floating" exchange rate regime characterized by its "peg to a currency basket" and "reference to the previous day's closing price." In detail, the former means, for example, if the RMB is pegged to the basket of currencies consisting of 1 unit of the U.S. dollar and 6 units of Japanese yen, then because of changes in the U.S. dollar/Japanese yen exchange rate, which is out of China's controls, China has to change the U.S. dollar/Chinese yuan exchange rate correspondingly. While the latter means, for example, if today's closing price falls, tomorrow's central parity rate would be set lower. Hence, the official exchange rate, which is set by the People's Bank of China (PBOC), would move in line with the changes in supply and demand in the foreign exchange market with very strong pro-cyclicality, which indicates an important step towards a floating exchange rate. These two factors usually "restrict" with each other to cause an "inertial" decline in the RMB exchange rate, which is always in a downtrend, regardless whether the U.S. dollar rises or falls. Because of this, we have the continued depreciation after the 8/11 reform. As Zhang Ming, researcher at the Institute of World Economics and Politics under the Chinese Academy of Social Sciences, believed, the RMB exchange rate still lacks sufficient flexibility. To fix the limitation of this pricing mechanism, the PBOC last May deepened the reform and introduced a third factor, known as the counter-cyclical factor, into the exchange rate formation mechanism. This new factor weakens the significance of the daily closing price against the dollar in the central parity calculation by hedging against the sustained depreciation pressure. Correcting the "pro-cyclical" trend makes the currency more market-oriented and helps stabilize expectations. It's observed that more than 80 percent of the yuan's appreciation last year occurred after the introduction of the counter-cyclical factor. That is the main reason for the rapid appreciation of the RMB in 2017. The aforementioned reforms on pricing mechanism are important in explaining the fluctuation of the yuan against the dollar in recent years, but the mechanism itself is just a price regulation tool with the aim of showing the "true" market-oriented exchange rate as much as possible. Theoretically, the "true" exchange rate should be determined by economic fundamentals and should reflect the market supply and demand. When China's GDP expanded 6.9 percent last year, picking up for the first time in seven years and well above the government's annual target of around 6.5 percent, global investors became more optimistic about China's economic outlook and the appreciation expectation was strengthened. As a result, higher demand for the Chinese yuan pushed up the central parity rate of RMB. 1. Balance of payments. When the income is larger than the expenditure (i.e., a surplus), the demand for the currency of the country exceeds its supply, and the exchange rate will rise. Conversely, when a scenario of deficit occurs, the exchange rate will fall. 2. Inflation. Inflation will inevitably lead to the devaluation of the currency, causing the fluctuation of exchange rate. 3. Interest rate. The country-specific interest rate level can directly affect the short-term capital flow across countries and affect the exchange rate. 4. Market expectations. Investors' (irrational) expectations about a country's economic situation, balance of payments, inflation, and interest rate prospects will cause the country's currency to be bought or sold in large quantities, driving the exchange rate to fluctuate. 5. Macroeconomic policies. Macroeconomic policies of a country, especially fiscal and financial policies, have a greater impact on exchange rates. 6. Intervention by monetary authorities. Based on the viewpoint of fundamentals, during the year, the RMB may still have room for appreciation against the U.S. dollar because of a more optimistic expectation about China's economic outlook. But in the long run, China's economy is facing many challenges, such as high debt levels and fast debt growth, industrial overcapacity, an imbalanced real estate market. Sustained appreciation of the yuan might not occur, but fluctuations would be normal given uncertainties in China's economic situation and in global economic situations as well. 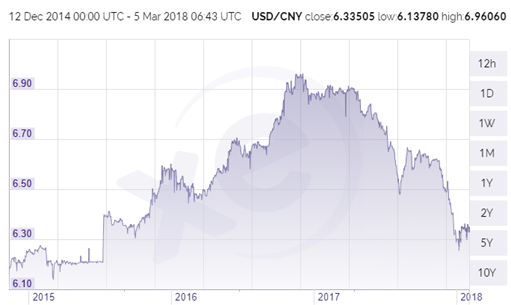 As Guotai Junan Securities pointed out from a trend point of view, "we think the RMB exchange rate against the US dollar may be 6.4-6.6, the US dollar index is likely to fluctuate in the 90-92 range, the volatility may be longer."